The Son or Filtronique room had a lot of conversations going on, but it was evident this was one of the Best Rooms at the show. The system here had a dCs digital front end feeding Audio Research preamp and monoblocks that powered the Verity Audio speakers. This room adds to the buzz that Audio Research is coming back very strong after subsisting in the shadows for some years. dCS and Verity have been there all along. The finish on the Verity was both subtle and rich with a vague blue-ish stain on Birdseye maple veneer that really came to life in the flash photo. I suggest you put a couple of small spotlights on these in your listening room when entertaining to show them off at night. 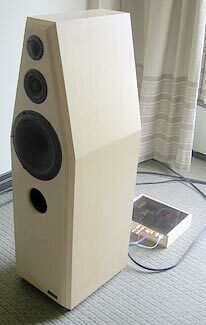 I also noted wood blocks used as vibration absorbing footers under the Audio Research gear. Tube gear, especially, benefits from some kind footer like this, yet it is bewildering how seldom such footers are used at shows. 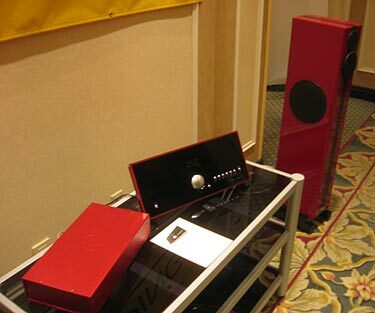 On silent display was a stack of black components from Wadia, YBA and Naim. YBA seems to be making a come-back in North America, too, perhaps more from a lifestyle direction than the YBA we knew back in the �90s when they had more reference level gear. Also on silent display, but should have been shown in a modest rig was a Magnum Dynalab 209 hybrid receiver that works on both electricity and soy based petroleum. You awake? Hybrid refers to the 6922 tube input and bipolar solid state output, which is rated at 125 wpc and doubles down to 250 wpc at 4 Ohms. Half of the output is Class A; the upper half is Class A/B. With a signal to noise ration of 115dB, this is a substantial piece of gear for someone who wants high quality, but also wants to keep it simple. Out back, it features two balanced inputs as well as several single ended ones, including a surround sound processor loop. Outputs include a line level preamp output plus two coaxial and one USB digital outs. So this unit can either stand alone or form the hub of a more complex rig. The MD 209 also has an IEC receptacle for the use of serious power cords. I also want to mention their ST-2 half-wave FM whip antenna. While I use one from their competitor, this design is excellent for either indoor or outdoor use. Surprisingly, I discovered that in my location, it worked far better when angled about 15 degrees across the expanse of glass in my window, rather than vertically aligned with the window frame. D�cor be damned! 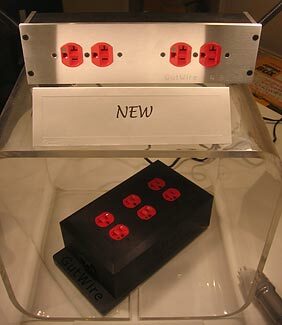 Drifting into a room full of tables filled with LPs and accessories on silent display I discovered Gutwire's new 4 Bar power conditioner ($1000) shown here over their more substantial 6 Bar model ($3200). Gutwire is perhaps best known for their power cables featuring separate housings for each conductor with a boondoggle weave and charcoal as an absorber of RFI and EMI. They also make digital, interconnect and speaker cables. This Canadian company has recently expanded into the China/Hong Kong market. On the other side of this large room were set up some rigs on active display. Listening conditions is this room were not optimal, but I did get to hear the Audes Orpheus loudspeaker (88dB/W/m efficiency, 6 Ohm load) from Poland. I've commented very favorably on their less expensive models in previous years and it was nice to see them back again with a more upscale speaker. A large side-firing woofer was barely visible on what appeared to be merely a sleek, two-way design. I was quoted $18K CDN and $16K US, one of the few instances where there was much of a difference in price between US and Canadian prices. 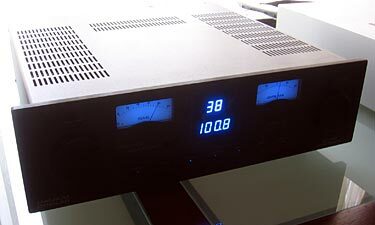 It was powered by a Mastersound Evolution 845 integrated amplifier, a parallel single-ended Class A design with zero negative feedback that puts out 55 wpc. While not widely known in North America , this Italian company makes a wide array of amplifiers and manufactures their own output transformers. This rig deserved a more hospitable environment, for sure. 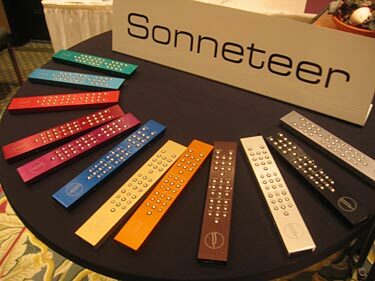 In another open and very public space was a lifestyle rig from Sonneteer that perhaps points the way to wider acceptance of high end products. While shown in bright red, a table full of remote controls had a color for every d�cor. Very Cool! Elac and Cambridge audio combined for a very nice sounding rig. The Elac speaker FS 249 here ($6300 CDN) looks like it uses Swarovski Crystal woofers, but they are actually the aluminum and paper sandwich crystal cones developed by this German company. The Heil-like ribbon tweeter, although actually very long, appears to be a more compact design due to the use of origami techniques that are said to produce superior performance. The folds in the tweeter are performed by hand while the final gluing is done with robotics. The highly regarded Cambridge 840 CD player was shown with a Plexiglas top for visitors to view the internal workings. Unfortunately I missed the photo-op. Playing back music files from a computer that displayed the mix levels and VU meters that were obstructively mesmerizing, I heard the new Thiel 2.5SE speaker ($9800 CDN) powered by Moon electronics that sounded better than any Thiel I've heard before � and there have been many. I also noted the extended feet used on this model to improve stability in the presence of show attendees and children in the home, a nice touch. I had bumped into Tash Goka of Divergent Audio Technologies several times during the show, but he was not present when I visited his room, unfortunately. 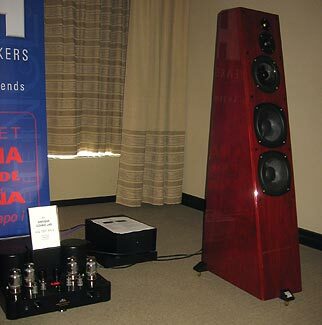 Their Reference 3A Grand Veena speaker ($7995) was being driven by a modest Antique Sound Lab AQ 1001 integrated amplifier ($1995), but there was also an Arion Audio MK 1000 monoblock ($3900) class D sitting on an amp stand behind each speaker that others might have heard. The Arion is rated at 500 watts and doubles down to 1000 watts at 4 Ohms with a Signal to Noise ration of 116 dB. Arion is a sister company to the well known speaker company Analysis Audio in New Jersey, whose speakers undoubtedly benefit from such a powerful brick. Arion uses an American made digital power supply, not the more commonly used ICE switch-mode model. 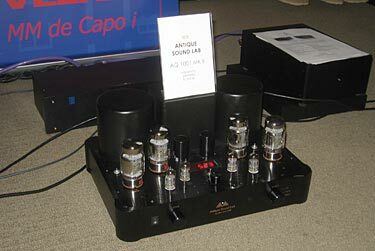 I expect the Arions were driven by an Antique Sound Lab Flora EX DT preamplifier ($3500) at the side of the room. This combo would have probably tipped the room into the Best Rooms category, but with the smaller integrated amp it was "merely" very good. An emm labs CD player was the source. Hathor Acoustik is a Quebec speaker manufacturer that I recognized for their natural plywood finish giving it a contemporary look. 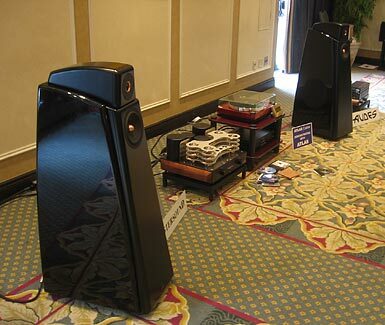 I heard their Reference 3 Voies, a three way speaker with external crossover and dedicated cable between the crossover and binding posts on the back for $20K. From the literature in French, it looks like this model is best heard at a distance of 12 to 25 feet, not possible in the hotel room, which may explain why it didn't live up to its price point, but it showed excellent promise. Two smaller models are priced at $10K and $5K. All have significant upcharge for piano black or metallic polyester finishes. Much more to come so check back for part 3!